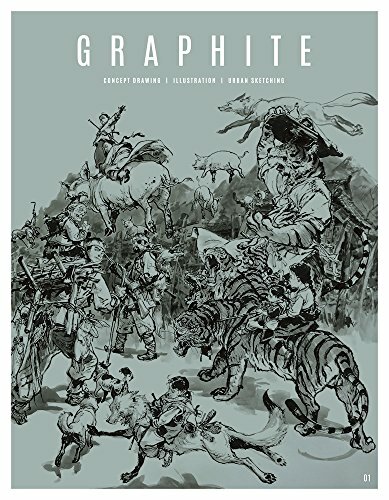 Back in April, 3DTotal launched a Kickstarter campaign to help fund this new GRAPHITE magazine they are releasing. The campaign was successful and they have mailed out the first issue in September. The magazine is produced by a small crew of 4 staff, and there are going to be four issues each year. First thing about the magazine is, there are no ads. The second thing is, it features artists in greater detail compared to other magazines. There are several pages for each artist in this 104-page paperback. Kim Jung Gi is briefly featured. Artists who are give more pages in the first volume include , Matthew Filipkowski, Eleanor Doughty, Benze, Jerel Dye, Sam Wolfe Connelly, Jan Buragay. The general theme is about concept art, urban sketching and illustration. There are some Q&A with artists, drawing tips, info about drawing supplies and a detailed look at the process of how some artist turn their sketch into a coloured illustration. There are lots of insights shared. The first volume is well produced. Can't wait to see who they feature in the future. Oh, there are no ads in this publication. You can either subscribe to the magazine on 3Dtotal.com or get individual volumes as they come out on Amazon.